Ambient Mysteries Vol. 1 represents a new series for us, being the first volume of albums with this title. The music chosen for this album and subsequent volumes are Ambient music that goes away from the “blissful, relaxing” new age music often connected with the word Ambient, and more over into the kind of cold, eerie, mystical music often heard in the new wave of Scandinavian crime dramas, as well as mystery / suspense films, TV series such as “Breaking Bad” and more. It’s Ambient music that lends itself towards the “darker side” of productions, but without actually stepping into horror territory, if you see what I mean. We actually considered calling this album “Nordic Ambient, Vol. 1” because we feel some of the music has a Nordic / Scandinavian feel (anybody familiar with some great Scandinavian crime series like “The Bridge”, “Wallander” and “Forbrydelsen” which was released in English under the name “Those Who Kill”? ), but in the end we decided to go with the somewhat less specific title, “Ambient Mysteries”. Lite Rock, Vol. 10 contains ten tracks of friendly, fresh, uplifting and heartening, melodic rock tracks, 8 of which composed and recorded by the undersigned, and two additional tracks by my good friend Dan Morrisey. I hope you’ll enjoy this one. Our “Lite Rock” collections are always quite popular; I think the music lends itself well to many types of media projects, including commercials / advertising, adventure sports / outdoor activities, fun and holidays, even corporate / business presentations. 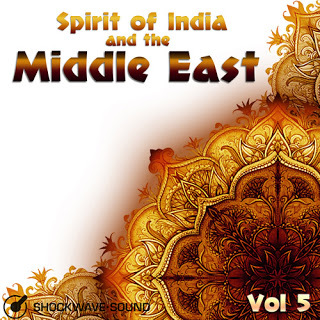 Spirit of India & the Middle East, Vol. 5 deserves a special mention. It contains 11 wonderful World tracks with the sounds, flavor and styles of the Orient / Middle East and India. Composed by Wael Mhanna with production support by his brother Jad Mhanna, who live and work in Lebanon, this album features music composed and recorded in the Middle East, unlike most “World” music you would get from a production music library which is actually composed in places like UK, Germany and America! Wael and Jad put together an ensemble of live human performers from Lebanon who played their traditional instruments on top of studio / sample arrangements made beforehand on computers. The result is a combination of programmed and real live human performances that just sound great. This collection has music representing the regions of Arabia / Persia – The Middle East, India and North Africa, including (but not limited to) Iraq, Syria, Morocco, United Arab Emirates, Kuwait, Bahrain, Oman, Iran, Lebanon, Egypt and Saudi Arabia. We’re releasing a new music collection today: “Pure Luxury, Vol. 7“. This collection features 11 tracks composed by Dan Phillipson, Bjorn Lynne, Felipe Adorno Vassao and Danny Duberstein. This is a chilled-out and smooth sounding collection of music that’s not quite as “floaty” or ambient as our “Relaxation & Mediation” series, but is rather rich in sound and usually feature a delicate beat and a sense of introspection and comfort. These tracks will go well with things like luxurious footage or TV commercials for fashion and style, for holidays, as well as for playing in places like Spas, Wellness centers, upper class Hotels and Resorts. As with all our collections, each track is available to license individually (just search for the track title in the quick-search box on our site, and the track will come up), or as a whole collection.